Family law issues are perhaps among the most personal legal matters you will ever face. 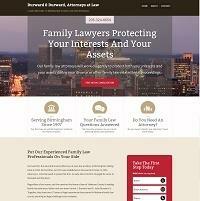 Our team at the law firm of Durward & Durward, Attorneys at Law, in Birmingham, Alabama, truly cares about our clients. We provide individualized attention and use the unique details of your case to build a strong strategy that focuses on your interests and rights. From the moment you have your free initial consultation with us, you will be speaking directly to one of our lawyers who is solely focused on helping you during this difficult time. Founded in 1997, our law firm features attorneys with extensive experience. Gerard (Gerry) J. Durward has been working with clients for 50 years, and G. John Durward, Jr., has been practicing for 19 years. Together, they pool resources and knowledge to handle cases that involve issues such as child custody and support, modifications and enforcement actions and divorce. Our attorneys are especially adept at working with professionals and business owners navigating high-asset cases, or those that involve business division or valuation. Whatever your case may entail, you can trust our insight to help you move forward. Durward & Durward, Attorneys at Law, serves clients throughout Shelby and Jefferson counties, including those in Pelham, Vestavia Hills and Liberty Park, Hoover, Mountain Brook, Irondale, Greystone, Trussville and Homewood. Our law firm can accept credit cards.